How to be prepared when using the automated trading system with a collocated server – UltraFX VPS – Moneywheel Research cPlc. Besides all the benefits that computerized automated trading offers, there is additional risk involved. In any situation where machines take part in a process, there is a possibility that the machine malfunctions or even fails completely. Traders have to be aware of this risk and have to be prepared for unwanted events as much as possible. The first and maybe the most important rule is do not leave the automated trading system unattended. We have heard stories about people going to work or on holiday and at the same time their robots trade alone. This type of algo trading is very irresponsible and dangerous. Human is the last resort of safety, who can press the “big red stop button” to end the process. Therefore there must be a person there who can monitor the systems and intervene when necessary. Automated trading systems are getting faster and faster and today even the lower tier latency systems are fast enough to cause substantial damage for its operator, in a short period of time. Users of collocated trading systems (like our VPS users) need to be especially prepared, because the physical distance makes it impossible to “quickly pull the plug”. It’s important to know that the low latency trading machines main objective is to be fast and the second objective is to be highly durable. It is impossible to build a racing car which is at the same time capable to be used as a truck to transport heavy concrete blocks. For example our servers and our network environments have a certain level of redundancy, but we designed it mainly for speed and not for safekeeping the stored data. Such highly tuned systems are more likely to have interruptions from time to time. However we are happy to say that our systems have run on a 99.99% uptime from the beginning. The base camp of automated traders is their servers or PCs running usually at their office or at their home. The collocated VPS is the frontier “fighter” which has more chance to fail in the battle. Therefore all strategies, important information, etc needs to be kept safe on the base camp computers and not on the collocated VPS. The only things that should be installed on the VPS are those essential to perform the trading operation. 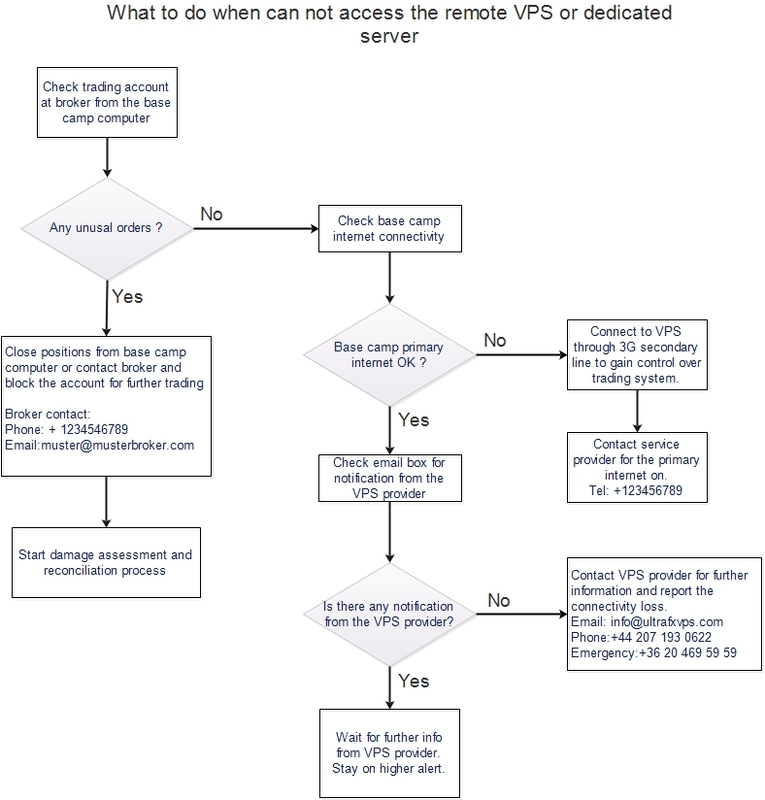 From the base camp computers traders must have a VPS independent connection to the broker (or trading venue) to close positions and if necessary completely block the trading access for the algorithm installed on the VPS. If blocking the access for the algorithm running on the VPS is not possible through the base camp platform, then direct telephone contact with the broker needs to be an open option. We highly recommended that the base camp has a minimum of two internet connections from different internet service providers. It has to be set on a fail over mode. When one line fails, then the connectivity is taken over by the other one. Many individual traders use the landline internet connection as their primary and for failover their telephone 3G internet line which is usually good enough to perform emergency tasks. When something goes wrong and hard earned money is at stake emotions often take over. Decision making is then rarely logical. For such instances every algo trader must have their own pre prepared emergency procedure. The procedure is a check list of “what to do next” a step by step guide written on paper (not on the computer in a word doc). It could be a flow chart. This paper should lie on every algo trader’s desk but even better, stuck on the wall. The above flow chart is a rough example. Everybody has to plan their own emergency procedure for the different emergency events. It is necessary to analyze different scenarios and work out the “what to do when” answers. It is very important to have all contacts (telephone and email) written down on this paper. Practice makes the master… Therefore we recommend from time to time, to go over the emergency procedure to make sure that when you need to act, it will happen fluently. How to test you present preparedness? Check with a stopwatch how long it would take you to make an immediate telephone call to your broker and tell him your account number. Remember every second could cost a lot of hard earned money.